A proactive approach in fall will prevent pests from residing in your home this winter. In this two-part series, Rose Pest Solutions explains how to protect your property against pests that try to get into your building in the fall, and emerge in the spring. These unwanted house guests are commonly called Overwintering pests. 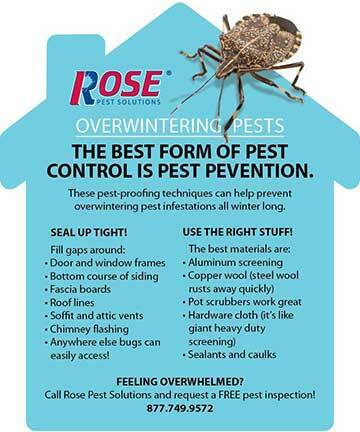 Rose Pest Solutions Offers Tips to Prevent Getting Ticked In Michigan, Ohio and Indiana. As the summer outdoor season ramps up and families head to their backyards, cottages and nature trails, tick exposure skyrockets throughout Michigan, Ohio, and Indiana. Known to live in tall grass and wooded areas, several species of ticks, including the Lyme disease-spreading Blacklegged ticks, can pose a threat to homeowners, campers and outdoor adventurers alike. Dale Hodgson, Rose Pest Solutions B.C.E. Regional Technical Manager in Ohio gives some handy tips to keep the ticks off you, your family and your pets. Rose Pest Solutions Saginaw Michigan manager Mike Rogers talks about the different species of ants, how to prevent them and how to get rid of them with Art Lewis on WSGW radio.